If there is a theme running through these songs, it revolves around surviving crises in a modern world — a task that might require actions and solutions that weren’t available or even possible for those who suffered injustice, grief and other survival modes in former generations. Eagle Rock students were instructed to create a character portfolio that assisted them in inventing an in-depth background covering their character’s life. The thinking was that such a personal assessment is necessary for the students to understand and develop who they are so they can successfully communicate their story. Performers use few spoken words, depending almost solely on songs to communicate their stories. Students focused first on themselves — identifying, discussing, and analyzing how or if they personally have an effect on the portrayal of their fictitious character. Every student performs at least one solo, which can bring forth a position of vulnerability, especially for those who have never performed in front of an audience. 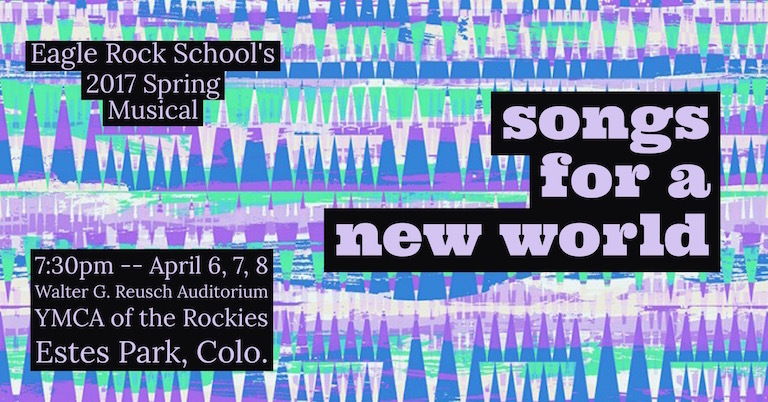 This entry was posted in Eagle Rock Events and tagged Jason Robert Brown, Musical, Songs for a New World, YMCA of The Rockies.